I’ve never been a fan of Valentine’s Day for a multitude of reasons, not in the least that it commercializes and commodifies something that is innately human and free. And while I can appreciate the sentiment of designating a day to appreciating love, I have to question why we allow only ONE day out of the year to focus on something that we all need, desire, deserve – every day of the year. What would it look like if we had the same focus towards love that we have on Valentine’s Day, every.damn.day? This year, on the very day that our nation is supposed to be neck deep in celebrating love, an armed 19 year-old entered his old high school and killed 17 people. This was the 18th school shooting in 2018. 18 school shootings in 45 days. If that isn’t a cry that our country needs more love, I am not sure what would be. These shootings send me straight to a place of anger, which can swiftly turn to hopelessness. The Being of a Nation road trip was nothing if not an experience in having hope, and that is what I needed on Wednesday – some hope. 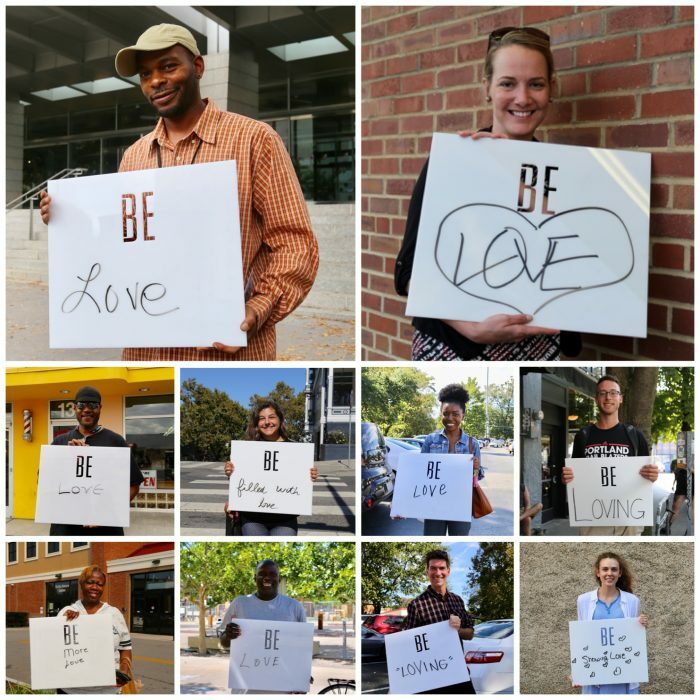 So, I decided to turn towards some of the The Being of a Nation interviews, and was reminded that one of the most popular answers to “How do you want to BE in the world?” was an iteration of BE Love. What this did for me, and why I am sharing it with you, is that it reminded me of the humanness of my fellow citizens. It centered me on the fact that I do believe that the majority of people in this country care. When I had the chance to talk with people across this country, that is what I overwhelmingly felt. It can be hard to remember that when you see children dying in senseless acts of violence, time-and-time-again, wondering why no action is taking place. It can be hard to remember it when you go onto social media, in a desperate attempt to feel some connection, only to encounter more fighting and endless back-and-forth rage. So, what would happen then if instead of debates on Facebook or angry tweets getting lobbied back and forth, we started approaching one another with more love? If we were placed face-to-face in front of someone who was different or had different opinions – how would we seek to find commonality? How can we see the human in each other? Because I believe that while we have lost our way, we are not lost. We just need to turn toward each other. Our country is hurting and wounded and in need of repair. But – We are the answer. We have to fix this. We need common-sense gun safety laws. And we need love to be celebrated and talked about and encouraged and focused on more than one day a year. First of all, you’ve got to love yourself. Everybody has shortcomings and, you know, nobody is perfect, you know?…So, I say, love yourself first and then it will be easier to love somebody else. That’s not selfish. You should love yourself. Being selfish is when you don’t love somebody else. That’s selfish to me. I think that there is actually a lot of love, I just think it doesn’t get as much attention as everything else. It would be nice to see some of the good things that are going on brought to our attention more. You meet good people every day. You meet people who are practicing and that are on the same journey as you daily…We focus a lot on negativity. Whatever you focus a lot on grows, so, it’s very nice to be aware. It’s also very nice to hear about the good things as well. Somebody wants to BE Love in their own life? I would say, just get rid of any kind of preconceived notions. Try to look on the inside instead of looking on the outside, and try to see what people are really about versus judging somebody by the way they look on the outside…I think America has a very, very, very long way to go. That was one of the reasons I chose this subject because it’s a lot of love that needs to be given around and we have a long way to go. It’s the old Biblical thing my meemaw taught me, do unto others as you would have done unto you. Just be nice and respectful and be perceptive of other people…you don’t know what they are going through. You don’t know what happened to them that morning. Just be perceptive of people and even if people are being ugly to you, don’t take that so personally. Just keep giving the love out. You don’t know what people are going through. You have no idea. Being Love pretty much enforces everything. There’s really no certain specific angle. If it’s coming from the bottom like your foundation, similar to the foundation of a home…if you have a solid foundation that the house should be steady. So, if love is your foundation then the rest that you encounter should be solid. I acquired it through other people showing me. From elementary school teachers, to people in church, to strangers on the street. You know, just genuinely showing love. So, they showed me love which made me want to show others. I think we’ve got to come together more and think as one rather than be so divided. That’s how we are. I think we should be more united. We need that. That right there shows more love…I think we shouldn’t think so much about different people, cultures, race, all of that. We are all one people. One God, one people. I think if we just narrowed that down to one and put the more love into it, we could probably oversee a lot of things. So, as a people, I think we are inherently wanting to push past all of our differences and BE Loving. So, I would say the nation wants to love, but it is being prodded not to. I think that is very disturbing and causes me to want to be even more loving to offset it. Well, first and foremost, I think a lot of people struggle with loving themselves and I think that’s something I’m trying to figure out…I think after that you have to move forward with the idea that you’re going to be compassionate and understanding of others and I think that’s how you live a full life…I think one of the hardest things I’ve learned is that differences don’t have to be something that is polarizing. I think that you just need to take another angle and understand where other people are coming from. Loving is an action verb. For me, what I’ve really been trying to do recently is to find ways to be loving and so I think more of our need to have that, or should have that, mentality to want to see what we can do for others. Where we don’t think about us all of the time, our career, our lives, our problems. Instead we try to focus outward and we think about the problems of others and the lives of others and with that, our world, our society would really take a turn for the better. I think the isolation that you find in Seattle, it can lead to depression and to feelings of disconnect that people are categorized by here, if we’re just loving towards ourselves and loving towards people around us and selfless in our actions and see how we can connect authentically then we would begin to instill this sense of community which I think our city and our society is deeply craving.